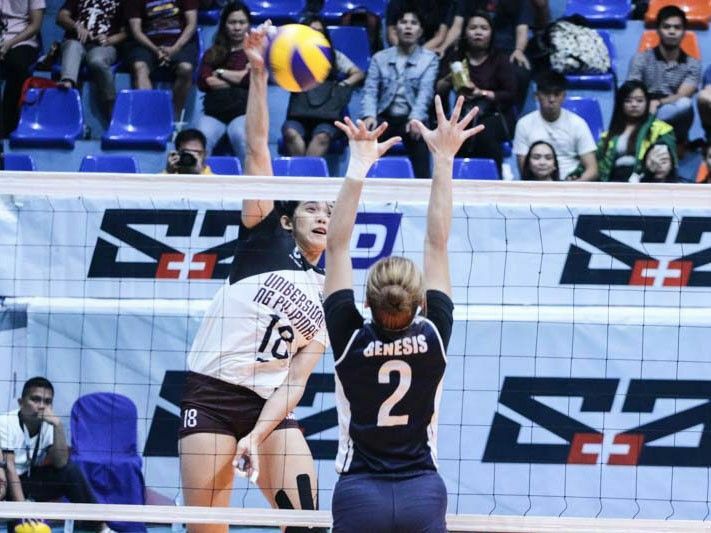 SAN JUAN, Philippines — The UP Lady Maroons finally scored a breakthrough win after fighting through an opening set loss against the Adamson Lady Falcons, 25-27, 25-14, 25-12, 25-21, in the 81st UAAP women's volleyball tourney at the FilOil Flying V Centre in San Juan City on Sunday. Recovering from back-to-back losses, the Lady Maroons end the first round on a high note. UP comes away with a 4-3 record, tied with the FEU Lady Tamaraws. UP co-skipper Ayel Estranero took home player of the game honors with four points and 28 excellent sets. Meanwhile, veterans Isa Molde and Tots Carlos scored 14 points each. Eager to break their two-game slump, the Lady Maroons started strong. Taking advantage of errors from the Adamson side, UP held an early lead, 12-6. But the Lady Falcons were just as determined to get their second win. Led by the services of Bernadette Flora and Eli Soyud, Adamson was able to buck their slow start and tie the game at 17-all. UP once again pulled away, 22-18, but shot themselves in the foot with errors. Adamson stole the opening set from the Lady Maroons, 27-25. Carrying the momentum from their first set stunner, Adamson found themselves in front in the second set, 3-0. But the Lady Maroons seemed to wake up after that, going on their own 6-0 run to double up on the Lady Falcons, 6-3. The run seemed to spark confidence in the Diliman-based volleybelles as a balanced team effort led them to the second set victory, 25-14. It was pretty much the same story in the third set where UP cruised against the Lady Falcons. UP took the 2-1 lead in dominating fashion, 25-12. The Lady Maroons looked poised to close out early in the fourth set, enjoying a sizeable lead over the Lady Falcons for most of the fourth. Back-to-back errors from Adamson gave UP match point, 24-17. Just when the game looked all but finished, the Lady Falcons went on a mini 4-0 run to cut the deficit to three, 24-21. It looked almost reminiscent of their shock loss against NU where they threw away four match points. But UP didn't want to make the same mistake again. Lady Maroon Maristela Layug made sure of this, scoring the game-winning swipe that ended UP's slump. Joy Dacoron was a bright spot for Adamson, scoring 15 points in the Lady Falcons' losing effort.